Imagine one day you were strolling around a park or a playground and you lose your College Identity card or any other important document for that matter. You would be shocked for obvious reasons. And Imagine if a surprise awaits you in form of something that would bring joy to your life. Yes, that's what has happened to Lauren , a student of the Fordham University. She may not be aware of the fact that a Hollywood super celeb would write a tweet and a Facebook post stating that he has found her ID card. Incredible! Isn't it? Lucky Girl, Lauren! No marks for guessing the actor. 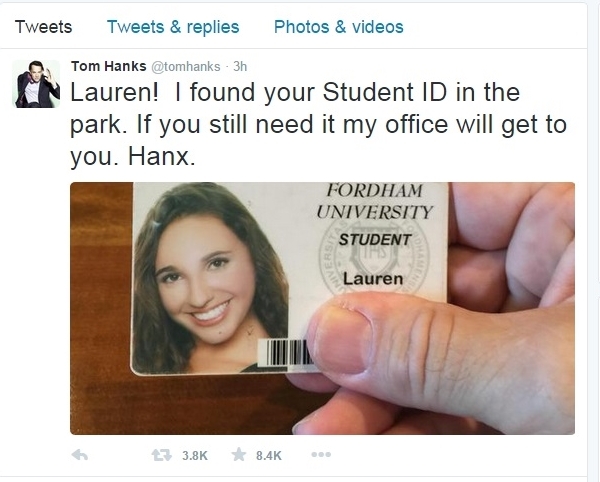 Its Tom Hanks, the super star who posted and tweeted a photo having the ID of Lauren. Lauren, well this might be your best gift for this year. If you happen to know this then kindly visit Mr. Hanks office and collect your ID card. Who knows there might be many more surprises awaiting you. Don't forget to click a selfie with Tom Hanks if you meet the legend. Not everyone get a chance like this. But frankly I do hope you get a chance to meet him. Check out the tweet that Mr. Tom Hanks had tweeted. And do we really have to mention the amount of Retweets, Favorites, Likes and Shares in Facebook and Twitter. That's the power of social media. This is a kind gesture from Tom Hanks! Such a bliss this, for Lauren from the Fordham University. And I don't even have a college ID to lose. Check out these reactions in Facebook. 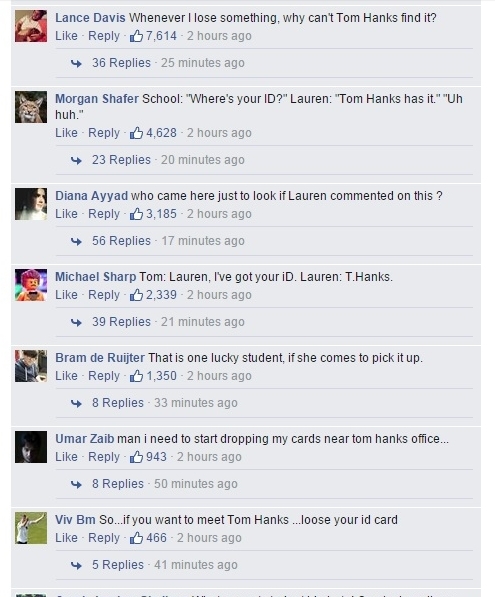 People now really want to lose their ID cards after Tom Hanks found Lauren's ID.